This collection explores the political philosophy and theory foundations for educational administration and leadership as they influence our understanding, analysis and practice in the field. The first section, "Political Philosophy: The Foundations," discusses the work of such writers as Machiavelli, Kant and Hegel, Hayek, Habermas, and Bourdieu as their theories apply to the educational context. The second section, "Political Analysis: The Critique," examines various types of political analyses, such as the politics of the policy process, minority politics, civil society, micro-politics, community politics, and cosmopolitan theory. The last section, "Current Political Controversies: The Practice," addresses current topical issues of a political nature, including the serving of the state economic agenda, the democratisation of educational organisations, the neo-conservative agenda, and globalisation. 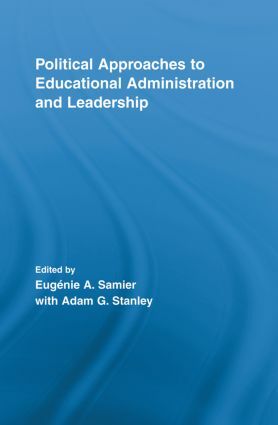 The broad international perspective from which these topics are covered makes this volume an excellent addition to the fields of educational leadership, organizational studies, and educational administration theory.